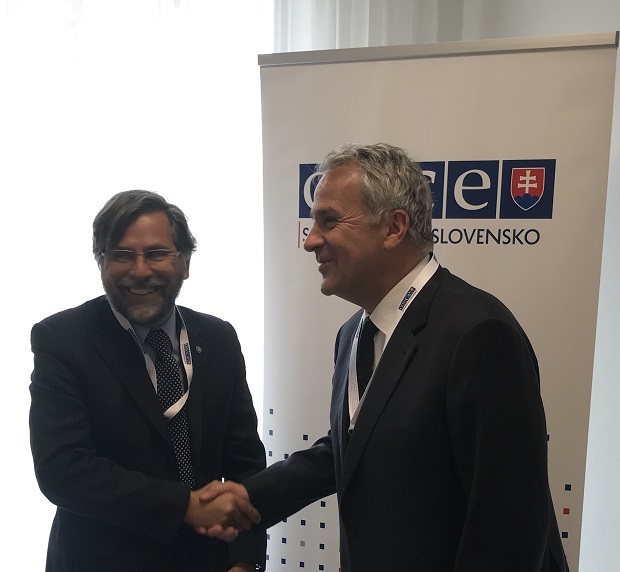 The Parliamentary Assembly of the Mediterranean (PAM) actively participated in the OSCE-wide conference on counter-terrorism, which took place in Bratislava on 25-26 March 2019. The key topic of discussion focued on the advances and progress in international-cooperation in countering terrorism and the implementation of good practices in preventing violent extremism. In the debate, Hon. Pedro Roque, PAM President Emeritus and President of the PAM Committee on Political and Security related Cooperation, highlighted the indispensable role of national and regional parliaments in global counter-terrorism efforts, as they provide the necessary legislation and oversight needed to make counter-terrorism efforts effective both nationally and through international cooperation required to combat this transnational threat. Hon. Roque shared with the participants the key recommendations that PAM has made to its member parliaments through the recent resolution on this issue, which was unanimously adopted by the Assembly in Belgrade at its 13th Plenary Session last month. Nearly 400 Participants from the OSCE region, which spans from Vancouver to Vladivostok, came together on this occasion to take stock of national and international efforts to prevent and counter terrorism, as well as violent extremism and radicalization that lead to terrorism. In addition to government delegations, the conference benefited from the participation of international organisations, including the OSCE PA, the UN OCT, UN CTED, UN ODCD, and the Council of Europe among others, as well as top counter-terrorism experts, civil society, and the private sector.